Hi guys, this post I have another Kleancolor layering experiment to share with you. The base color is Orly Sapphire Silk, a beautiful muted teal with a great application. On top I used Kleancolor's Afternoon Picnic, a clear polish filled with HUGE different colored and sized glitter. I'm talking about chunky glitter on steroids here! 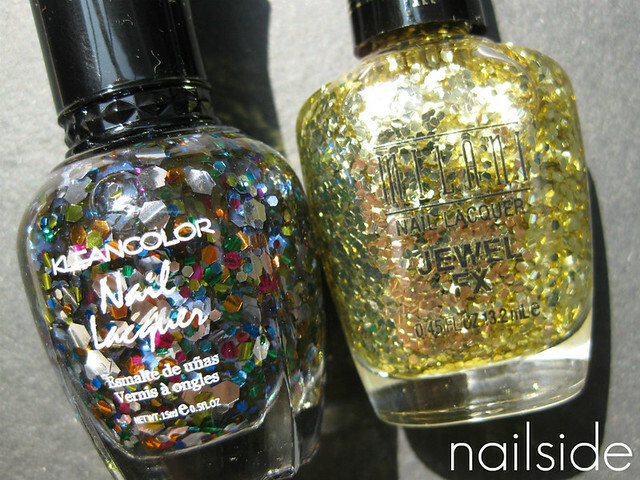 Just to make a comparison, I included a picture of Afternoon Picnic next to a Milani Jewel FX polish, which already has large glitters. 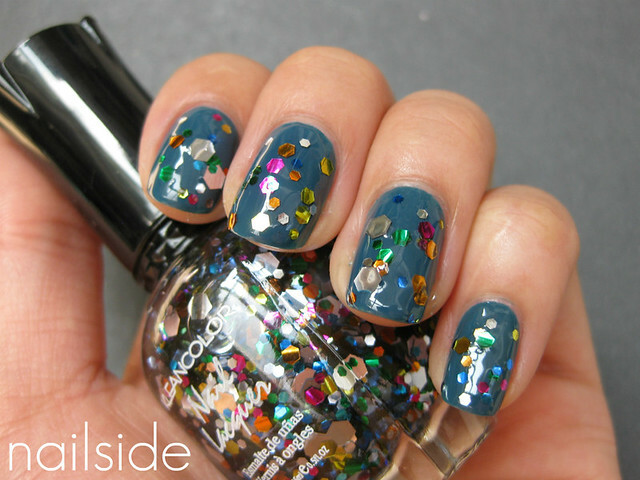 As I said, Afternoon Picnic is a blend of multiple colors and sizes glitter. Once you've finally been able to fish out some of them, it does look pretty. But man, I wish more of that amazing stuff would stick to the brush. I think I've had to apply three, incredible thick layers on each nail to reach the density as seen on the pictures. So it most definitely needs fast drying topcoat, otherwise it will take you about four ages to get your nails dry. So not the best application nor drying time... But would you look at the result?! It's so festive! And people will notice the glitters from a mile away. And last but not least, I also wanted to share the matt version of it with you :) Thanks for reading! Whoa, those glitter particles are gigantic! Compared to that the Milani Gems I got recently looks like nothing. The Orly color is also very pretty as I like teals a lot. Nice combo! I love that glitter! It looks amazzzzing! I just received Afternoon Picnic in the mail yesterday and I love it! It looks funny in matte, I must try that later. 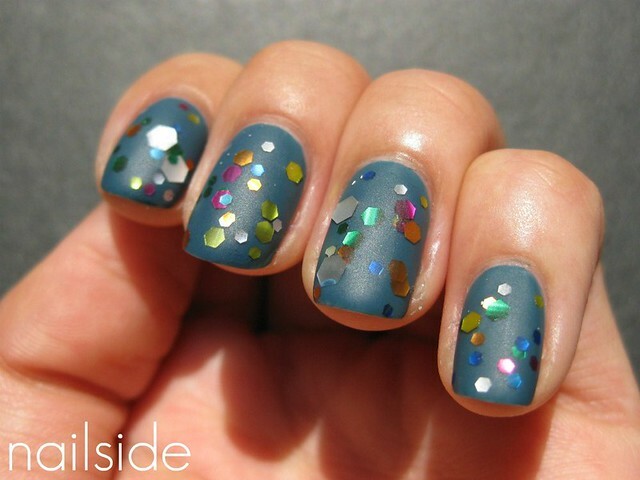 Great glitter! I wish it was denser though. I have Orly's Sapphire Silk, but have never worn it with a glitter. I might have to try that out now. Nice swatches! wow i love that glitter! I hate how glitter nail polishes take loads of coats to look decent! But hey, the results are fabulous!